No splitting, lots of drilling – don’t forget the glue! I used some 6d bright finish nails and wood glue to secure the two edges of the 1×10 and 1×12 together. I drilled pilot holes so I didn’t split the wood, but you could easily use a nail gun for this project and skip all of the pre-drilling and nail setting. But since my material was made from some pretty stringy pine, I figured my nail gun would be popping nails out on all the knots in the wood, so I went with the old tried and true hammer. Once I had the two 1×10’s nailed to the top and bottom, I installed my dividers. I used some leftover pieces of 1×10 that I cut to 9-1/4 –inches and ripped to 8-1/4 –inches. This left the dividers tight between the 1×10’s for supporting the box spring and mattress sufficiently, yet recessed them into the cubby hole slightly so I didn’t stub my toes on them in the dark. Speaking of which, you may want to slightly undersize the base for your mattress to minimize unwanted toe-to-frame contact. After I put one on each end of the boards, I found the center and installed another divider as well. In the near future, I’m attaching four 15-inch doors across the cubby-end. Don’t want doors? Just cut a 45 degree angle on each end for a neater look. This part of the project was a no brainer for me, but if you’re not worried about putting doors at the end of the bed, then you may want to 45 each end of the bed frame so you end up with a nicer finish on the corners. However, since I’m mounting doors and hardware on the edge of the 1×12, I opted to follow through with my 1×12/1×10 side pieces all the way to the foot of the bed. 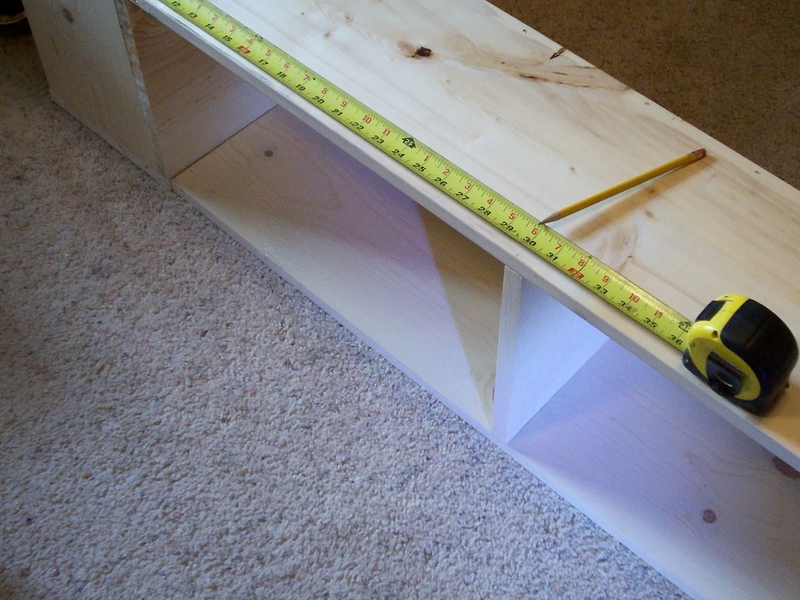 I measured the foot of my bed, subtracted the two side pieces to find the width of my end cubby. I built the end cubby the same way I did the other two side cubbies – by sandwiching the 1×10’s around the 1×12 and installing three dividers for support. After I nailed the end cubby together, I installed it in between the two side cubbies and toe-nailed it together. Since there’s a big open space in the middle of the bed frame that needs some support to hold the weight of the box spring and mattress, I nailed two 2×4’s on their side across the head and middle of the bed frames. I cut four 10-inch 2×4 blocks for support under the longer 2×4’s and attached them to the inside of the frame so that the nails went into the edges of the 1×10’s and not into the face. 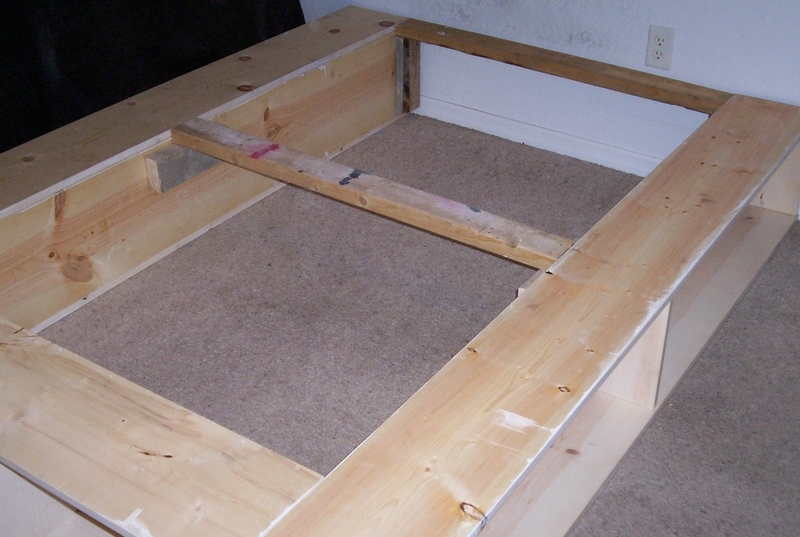 This added much needed support for the bed and it helped keep the frame nice and square. 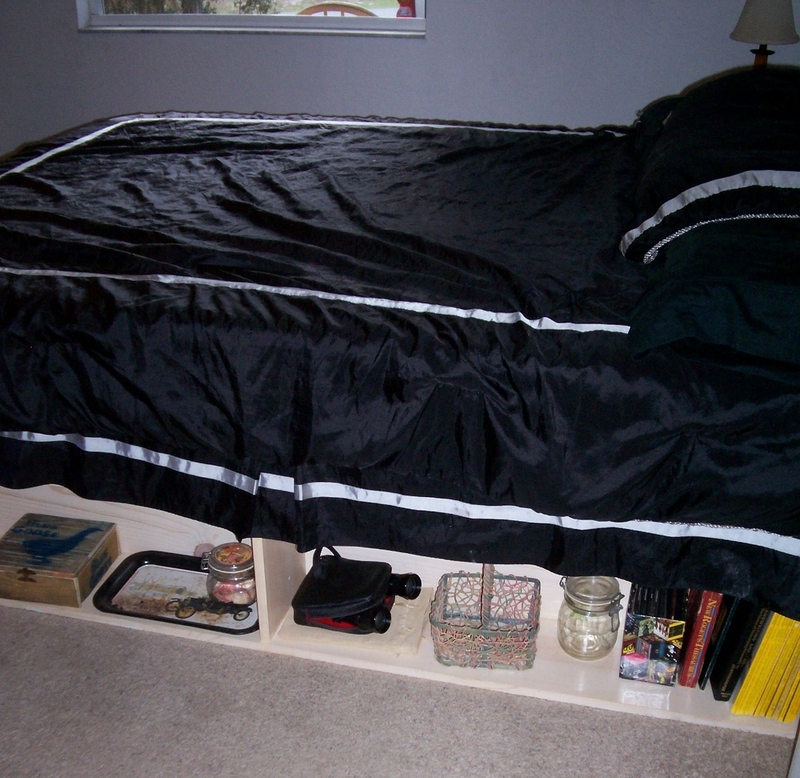 After a quick clean up, the box spring and mattress were ready to go and I was ready for a good night’s sleep. I need to make something like this since our bedroom is full of stuff. Another one for my son’s bed would be good too. Thanks for the idea, I’ll have to see what I have as far as 1×10, 1×12 already. Cool! Let us know how it turns out! Great Project, it would be good to raise the cubbies a few inches off the floor for the sake of cleaning and stopping dust balls from getting into the cubbies.